2018 has been rocky for the first quarter for us. We spent quite a bit over our projected budget, largely due to medical spending which totaled just shy of $4,000 for the quarter. The stock market overall was down for this quarter which muted a lot of our contributions. We maintained a 47% savings rate, however this is unlikely to be sustained throughout the year, as a lot of our savings was front loaded this year due to high income for quarter 1 and 401K accessibility issues. Total spending for the quarter ended up at $14,023. 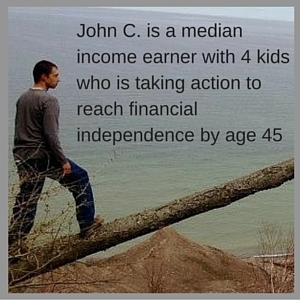 This works out to $4,674 per month, over $1,100 per month over our target. Medical expenses were a heavy hitter for this quarter with a total of $3,790. This included 2 root canals for Mrs. C, the last 4 payments for our oldest kids braces, and an ER visit due to complications with Mrs. C.’s Grave’s disease. (she is OK). We’ve hit our deductible for the year on medical spending so going forward we have a 10% copay, which will greatly reduce our medical costs in future months. We spent $2,973 on Groceries, which also includes some general merchandise, birthday presents, Easter supplies, and pet supplies. This is quite a bit higher than ideal, however it does include a $220 grocery trip on March 31, so a bit of this will show a benefit next quarter. I do a horrible job of keeping track of my spending these days, I’m sure a good chunk of this spending is gas purchases at the Meijer gas station that get recorded as “groceries” because it’s technically a grocery store. Keeping these expenses separate is certainly an area of improvement for me. We spent $1,711 on our monthly mortgage payments for our primary residence. $951 of that is principal repayment. I’m thrilled to finally be past the tipping point where more of our house payment goes to principal than to interest. We spent $1,342 on “General Merchandise”. The heavy hitters here were a $300 snow blower, $265 for a printer for Mrs. C’s mom as a gift for going 1 month without smoking (after 40+ years of being a smoker), and $208 for a TV for Mrs. C.’s mom as a birthday gift. She just passed 3 months of no smoking this week! We spent $1,024 on our winter property taxes, this is roughly an even split between our primary residence and our rental property. Mrs. C. went in with her siblings and bought a new 50″ TV from Walmart for her mom for her birthday in February. She received 5% back on the $248 TV through her Ebates account. Currently you can get a $10 gift card for signing up for a free Ebates account through this referral link. Unfortunately the TV had an issue with the speakers and had to be returned. She then ordered it again, this time the price had dropped to $228. Well, the FedEx guy delivered the TV on a melt-off day here in Michigan. The TV wasn’t wrapped in plastic and it was set directly under an eve in a puddle of snow/water. When we arrived home and saw the TV all the snow had fallen off the roof onto it and the box was soaked. Needless to say the TV went back. Mrs. C. then ordered the same TV for a 3rd time and the price dropped another $20 to $208. After another brutal winter, Mrs. C. decided that we need to get a snowblower, especially since there are times that I am working out of state leaving her to clear the driveway. She was able to get a 2 stage electric start snowblower for only $300 at the end of the season on clearance, the same model is normally $800. I finally bought myself a 40V Ryobi Electric Chainsaw . I do a lot of trimming of fallen trees out in my woods, and I think this will be a much lower hassle saw to use than my gas saw. I’m sure it won’t be able to do everything my gas saw does, but for $90, I couldn’t pass up the deal. The 40V chainsaw is normally $130 without a battery pack, and since I already have 2 battery packs from previous tool purchases I felt comfortable buying the tool by itself. Our memberships are still current to our local zoo, kids museum, and the Chicago Museum of Science and Industry. Now that winter is over-ish and my spring work season is pretty much done, we will be taking some more trips to zoos and museums with reciprocal membership benefits. This does not mean that we are on track to save over $48,000 for the year. During the first quarter our earnings were higher than what they will be for the other 3 quarters of the year. I’ve been working 75 hour shifts at my highest paying job, which just finished up a couple days ago. This is the one employer that I have access to a 401K through so we front loaded a lot of our retirement savings for the year into my 401K while I had access to it. Currently our cash position is fairly high and we will be reducing it here shortly. Towards the end of quarter 2 we will transfer a large chunk onto our mortgage balance. We will also be taking a trip to Disney in August which will reduce our cash stockpile further. We have stopped contributing to our taxable brokerage account until we have the house paid off, so that account will stay static for the next few years. We will contribute to our IRAs in the second half of the year. 1. Keeping house expenses low: Our total housing costs are only 10.3% of our net after tax income. This is 20% below most guidelines. 2. Keeping vehicle expenses down: We pay cash for our vehicles are drive very modest vehicles compared to our income and net worth. Our total vehicle value is only 8.8% of net income and only 2.8% of our net worth. 3. Optimizing taxes: I use my tax planning spreadsheet to optimize our taxes. We contribute a lot to tax deferred accounts, which is able to keep our AGI low. A low AGI means a lower tax bill, lower Obamacare health insurance premiums, and the ability to qualify for the retirement savers tax credit. 4. Bank raises: As our income has increased we have saved the vast majority of those increases. I track my investments with Personal Capital and using my own spreadsheets and charts. All of my accounts are linked to Personal Capital, so I can quickly see how I am doing overall without having to log in to a half dozen different accounts. So far this year our return is in negative territory. Right now you can get a $20 Amazon gift card for signing up for a free Personal Capital account and linking at least 1 account to it if you visit through this link. Tesla: I own 60 shares of Tesla Stock that I purchased for an average cost of $200 per share in 2016. 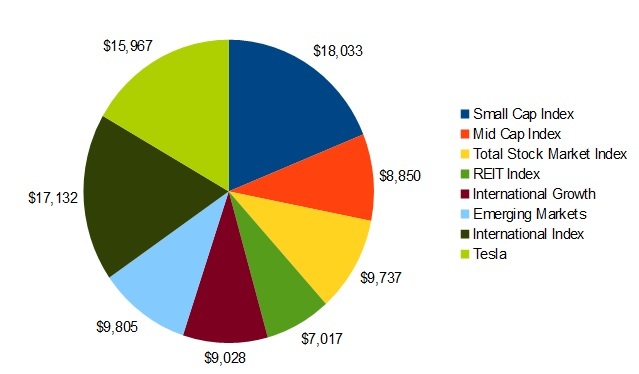 Tesla has receded quite a bit from its highs of $380 to $266 at the close of the quarter. Tesla has since rebounded towards the $300 mark. With Model 3 production increasing substantially at the end of Q3 and Elon Musk assuring investors and the public that not only will Tesla not need another capital raise, but that it will be profitable this year is reassuring. I didn’t invest in Tesla for what will happen this year, I invested in Tesla for what I think will happen over the next 20 years. Overall my investment in Tesla is a small portion of our overall net worth, so I don’t stress over the high fluctuations over the short term. eBay: I had a small amount of cash in one of my brokerage accounts and used it to buy 2 shares of eBay, rather than sitting as cash forever. Obviously this won’t grow to any large portion of my portfolio. We have continued to pay an extra $300 per month on our mortgage and will be making another large payment towards our mortgage at the end of quarter 2. I think a payoff date of December 2021 is our most likely finish on our primary residence with our rental house following 6 months later. We bought our home in the fall of 2011, so this plan has up paying off our home in 10 years total. In our previous update I had goofed and written that we planned to payoff the house either in May of 2020 or December of 2020. I’ve been shooting for May of 2021 to December of 2021 for years, I’m not sure where I got the 2020 number from, but that was a typo. Cutting that extra year off would be extremely aggressive and just doesn’t fit with our projections. 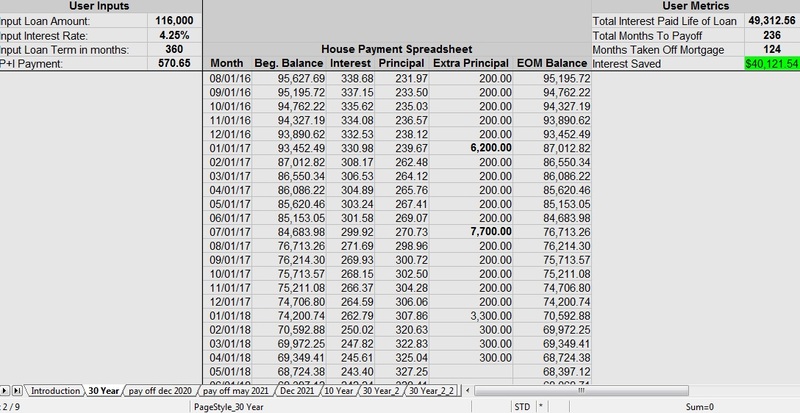 I track my mortgage payoff with a mortgage spreadsheet I created. With how long term the goal of paying off my house is, I made this spreadsheet to help keep me motivated. It shows me exactly how many months I have taken off my mortgage and how much interest I have saved to date. If I never make another extra payment I have already taken 10 years off my mortgage and saved $40,121 in interest. The slight discrepancy between the end of month number on this chart and the total balance remaining I reported above is due to the actual date our extra house payments come out on. Skymiles balance: 165,494, this will be reduced greatly as we plan to use the vast majority of this for our hotel on our 2018 Disney trip. We don’t have a high demand for flights, as my employer directly pays for all my work flights and Mrs. C. has no desire to ever get on a plane. Add in that we would need 6 tickets to go anywhere as a family and our Skymiles are much better spent on lodging, even though the cents/mile is much better for flights. When I had previously looked into using my Skymiles for hotel stays it looked like I had way more than enough accrued because we could rent either a 2 bedroom hotel suite or a 3 Bedroom home for around 13,000 miles per night. Now the pricing is about double that, which greatly cuts into the utility of these miles, doh! Choice Points: We are in the process of racking up Choice points for future vacations. Our Choice Privileges Visa card has no annual fee and we use it for virtually all of our expenses. So far we have 79,000 points, enough for 6 to 7 nights at most hotels. Hilton Honors: We have 122,000 Hilton Honors points. Most Hilton hotels are in the 20K to 35K range for redemption. There are 2 hotels for 10K points that are strategically located for us. 1 in Bowling Green, OH which is perfect for trips to Toledo, Detroit, and Cedar Point, and 1 in Seymour IN which is a little past halfway to my parents house. Having 120,000 points then gives us about 10 free nights. I will continue adding to this balance as my employer often has us staying in Hilton hotels. Action Economics income is down a bit for the quarter. Part of this is seasonal, however a large portion of the reduction in income came from Action Economics getting hacked back in February. Although I was able to neutralize the threat within a couple days, there were lingering effects that took a few weeks to heal. Quarter 2 will show a bigger drop in income for the month of April. 2 Responses to "Quarter 1 2018 Update"
I have a couple of battery powered chains saws, one is a pole saw. Love them. You will not regret that purchase. Thanks to your comments about paying off your home early, I made a one time payment of a years worth of principle. Saved over $4,000 in interest. Feeling pretty good about that. Glad to hear the saws are working well for you, I still haven’t had a chance to try mine out yet, hopefully sometime next week I’ll be able to. Very cool! Congrats on saving that much interest in one shot!